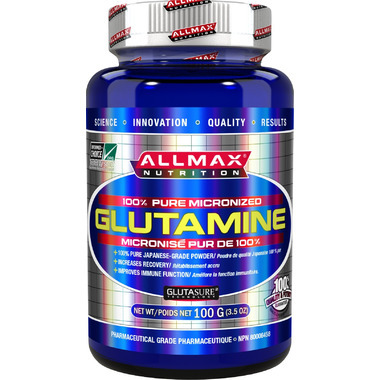 Allmax Glutamine is manufactured with the purest raw ingredients at a Pharmaceutical Grade Manufacturing facility Allmax Nutrition Japanese Micronized Glutamine provides recovery after training and enhances the immune system that can be compromised during intense exercise. Allmax uses proprietary Glutasure technology to minimize the particle size of the glutamine, creating a clean, white and extremely fine powder. 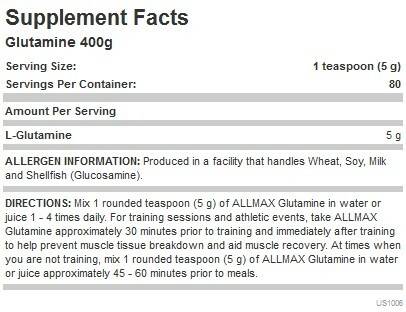 Allmax Nutrition uses only the purest raw ingredients through a pharmaceutical grade manufacturing facility. This product has worked wonders with my body aches especially from all the working out. Personally take 10mg a night mixed with a little bit of AminoCore. It's like magic!